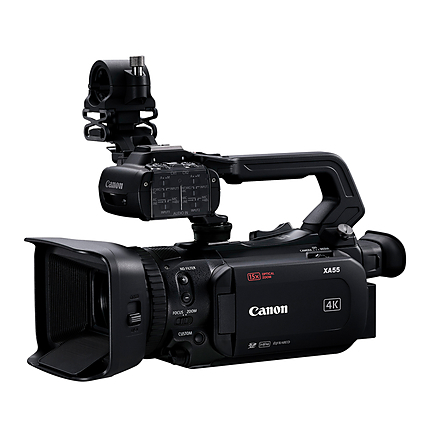 The Canon XA55 4K UHD Pro Camcorder offers an outstanding 4K UHD image quality, as well as video features and functions, while sporting a compact & portable design. 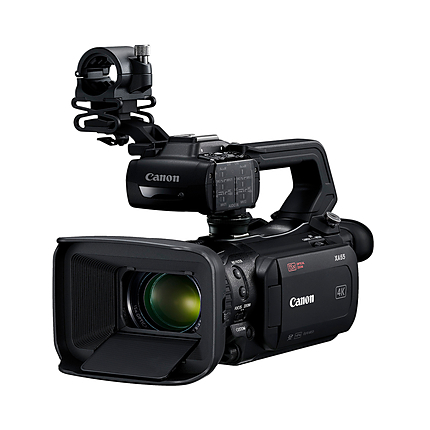 This camcorder is ideally suited for on-the-go Electronic News Gathering (ENG) & documentary production. It features a 1.0" 4K UHD CMOS image sensor & DiG!C DV 6 Image Processor, making it able to record in XF-AVC or MP4 formats to dual SD card slots. The camcorder is capable of capturing 4K UHD video at 30p, as well as slow motion recording up to 60fps in Full HD (30 fps in 4K UHD). 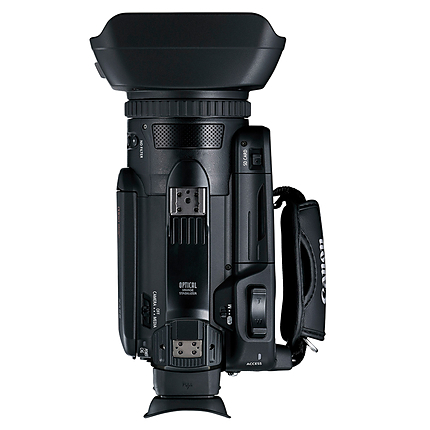 Its 15x optical zoom lens maintains 4K UHD quality throughout the zoom range, while its Dual Pixel CMOS AF helps create fast & accurate autofocus. The camcorder features an HDMI 2.0 terminal with 4K UHD output support, & two XLR terminals with individual audio level control. 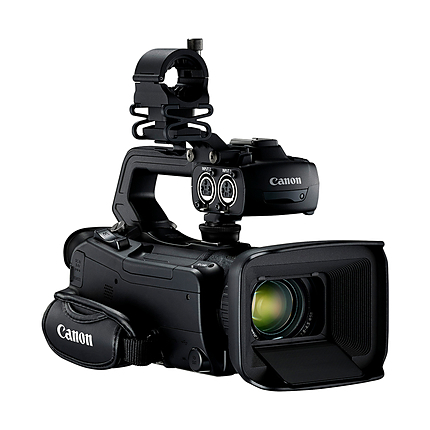 The XA55 also features a 3G-SDI terminal that supports camcorder integration into professional workflows. Its adjustable 3.0" touch panel LCD monitor & built-in 0.24" electronic viewfinder enhance usability. Its detachable handle helps it operate in a variety of shooting environments. The XA55 is designed to meet the needs of professionals, while offering a wide range of recording possibilities. 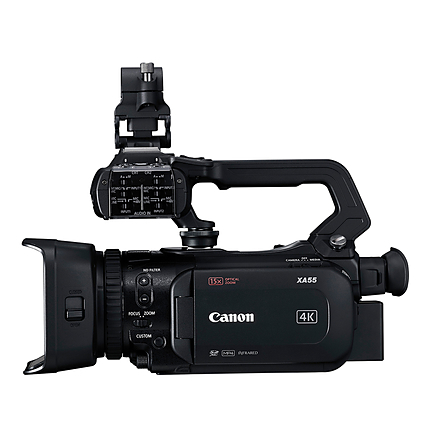 The Canon XA55 4K UHD Pro Camcorder features a Genuine Canon 15x Optical 4K UHD Zoom Lens that maintains 4K UHD quality throughout the entire zoom range, & offers a focal length range of 25.5 to 382.5mm (35mm film equivalent). When shooting in Full HD, you can get up to 30x Advanced Zoom, which utilizes the XA55 camcorder's full 4K UHD sensor, to extend the zoom range, while maintaining image quality. The lens also features a 9-blade iris, which produces an artistic & beautiful out-of-focus area/"bokeh." The 9 blades allow for circular blurring in out-of-focus areas, while also using an odd number of blades to help reduce flaring. Also included is an internal 3-density ND filter, allowing you to select from three densities (ND 1/4, ND 1/16 and ND 1/64), or turn the feature off. The "Wide Attachment" offers a 0.8x wider angle of view that allows you to capture more of a scene, especially when indoors or in small areas, to lend better perspective to your video. The Tele Converter also provides an extended 1.5x longer telephoto range for the XA55 camcorder's fixed lens, which allows distant subjects to be captured with remarkable clarity. The XA55 Professional Camcorder features a Canon 1.0" 4K UHD CMOS image sensor, capable of 4K UHD video capture at 60p, & slow motion recording up to 60fps in Full HD (30 fps in 4K UHD). The camcorder's sensor makes it a strong contender for professional productions, creative fields & more. 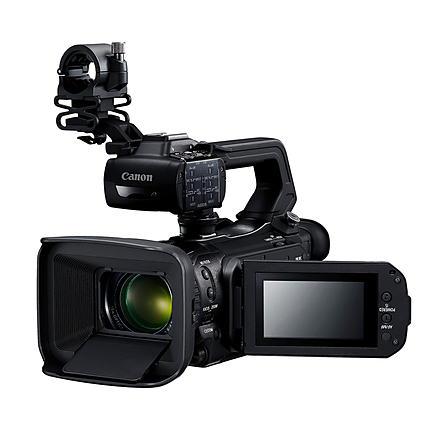 The Camcorder features a 3.0" Touch Panel LCD, as well as a newly designed 0.24" Electronic Viewfinder (EVF). The Touch Panel LCD & EVF provide clarity of desired features along with a number of menu options for controlling your settings. The Touch Panel LCD works with Canon's AF technologies for easy monitoring, & one-finger tap-focusing during shooting. 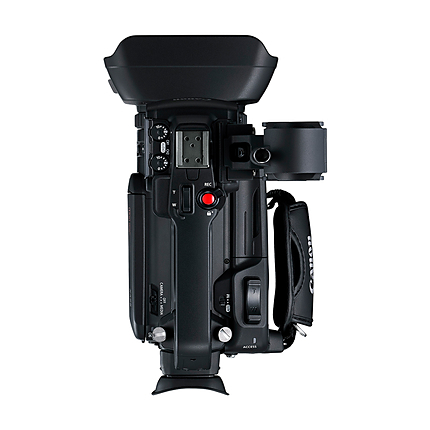 The EVF offers 45 degrees of tilt for more comfort of operation in a number of positions. The XA55 Camcorder incorporates Canon's DiG!C DV 6 Image Processor, which provides high image quality, advanced performance, & convenient operation. This processor provides the power & speed that allows features such as 4K UHD video acquisition, image stabilization, slow & fast motion recording to function. The camcorder's "Over Sampling HD Processing" feature allows for Full HD recording through the use of its 4K CMOS Sensor. 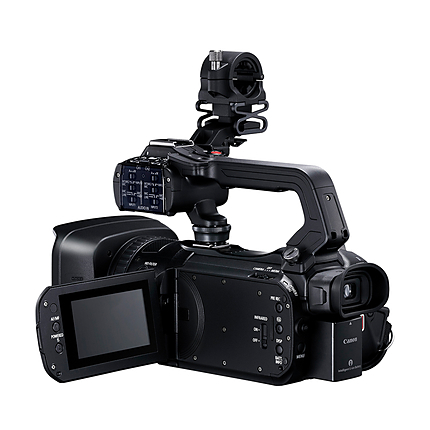 The XA55 camcorder also is designed with a 5-axis Optical Image Stabilization (IS) system. Standard, Dynamic & Powered are the three Image Stabilization modes that are featured in the XA55. In "Standard IS" mode, the stabilizing angle is made constant & separatte of the zoom magnification. In "Dynamic IS" mode, the stabilizing range is extended at the wide end of the focal length, allowing for stabilization when shooting while walking. "Powered IS" mode helps facilitate stabilization in the low frequency range at the tele end, & should be used solely for fixed-point shooting. The XA55 Professional Camcorder can record to dual SD card slots in 4K UHD & Full HD resolutions. Multiple recording modes, resolutions and frame rates make the camcorder creatively flexible & adaptable to a wide range of fields from broadcasting to cinema. The camcorder's dual SD card slots allow for simultaneous or Relay Recording. Simultaneous recording allows you to record on both SD cards at the same time, so that you have a backup copy. Relay recording allows uninterrupted recording from one SD card to the next, once the first one is full. Also supported is slow and fast motion recording. You can record in a different frame rate from playback for slow & fast motion effects. Slow motion recording of up to 60 fps (x0.4) in Full HD (30 fps in 4K UHD) is supported, allowing you to create an emotionally moving video. This is a type of port used to connect a camera to a computer via USB cable. Viewfinder: 0.24-inch TFT wide color LCD, approx. 1.56 million dots, approx. The fastest amount of time a shutter can remain open. This is practical for stopping motion completely. Controls to get the correct exposure for a photo. This is an output for HDMI cables for high definition playback. The frame-rate is the frequency of images of a movie that are displayed every second. The higher frame rate a movie has the smoother objects move in the movie.